Back in November 2010, an interesting experiment took place - researchers handed 115 iPads to medicine residents of the University of Chicago. This gave the physicians the capability to go into the hospital’s system to order tests, then to access electronic patient records, and look up medical publications for reference information. More than a year later, the residents love it. Three out of four of them found they were finishing tasks faster with the iPad as it freed up time for direct face-to-face time with patients, and allowed them to participate more in educational trainings. The cost? Each iPad came at about $650 counting the insurance, covers, straps and software the hospital purchased along with each tablet. The whole affair was secure - the patient records were not stored, only accessed on the network and the tablets were password protected. - 68% mentioned it prevented patient care delays. 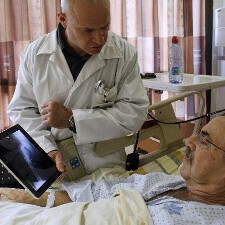 Interestingly, introducing computers and electronic health records only slowed down doctors and they found less time for patients themselves, something that the iPads helped deal with. The iPad also helped streamline the lengthy process of completing documentation and updating patient records. “We were encouraged to see that this technology could enhance patient care in the setting of restricted resident duty hours,” chief resident Dr. Christopher Chapman summed up. haha! another advertisement for the iPads.. i think any tablet can do that.. it should be titled: "tablets in hospitals improve patient care, physician training"..
in this case, they only use iPad in their experiment. So as long as they dont use other tablets, your statement is wrong. Hospitals have been starting to use tablets for a while now. This is the first that ive seen them use iPads. Most went to smaller android tablets like the dell streak 7 and galaxy 7 since they are cheaper and more easily portable. and exactly what "utility" does an ipad have that an android tab or another doesnt exactly? ipads do the LEAST of all the tablets, they just cost the most because you are buying the name. The iPad also cures all forms of cancer,heart disease and diabetes!!! Maybe we should send some iPads to the Middle East,and who knows... perhaps magically Iran will quit nukes,and Israel and Arabs will embrace each other as brothers... What a load of hogwash!!!! Ugh, when will the Apple propaganda end? Doctor: Hmmm you have shortness of breath and pain in your legs? There's an app for that! Let me check my iPad for a cure and throw out all that time and money I spend in medical school. that is probably a DVT that progressed into a pulmonary embolism. Throw some heparin, asprin 81mg, and a clotbuster in, STAT. Put some pressure stockings on the legs and raise them up a bit. Get the patient Ambulating as soon as you can.